Ernesto Valverde has been reported to have decided to risk Ousmane Dembele for Tuesday night's UEFA Champions League second leg at home to Manchester United. Although the 21-year old has just returned from a hamstring injury layoff, Valverde feels that his pace and trickery will be much needed as Barcelona look to press on their 1-0 advantage from the first leg win at Old Trafford. Barcelona hasn't progressed past the Quarterfinals stage of the UEFA Champions League in the past three seasons and the pressure is immense on Valverde to deliver, especially since the La Liga is considered to be already in the bag. The defending Spanish champions Barcelona are 9 points clear at the top of the La Liga table, with only 6 games to go. 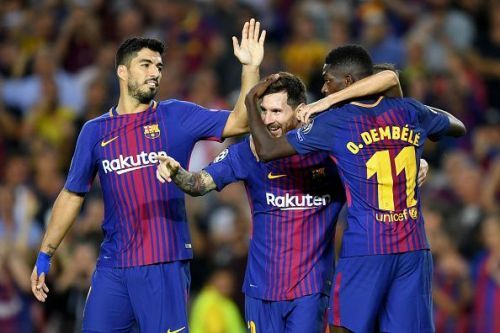 Spanish outlet Sport has reported that Valverde has decided to go on the front foot and start the trickier and quicker Dembele instead of Coutinho, to partner Luis Suarez and Lionel Messi in attack.